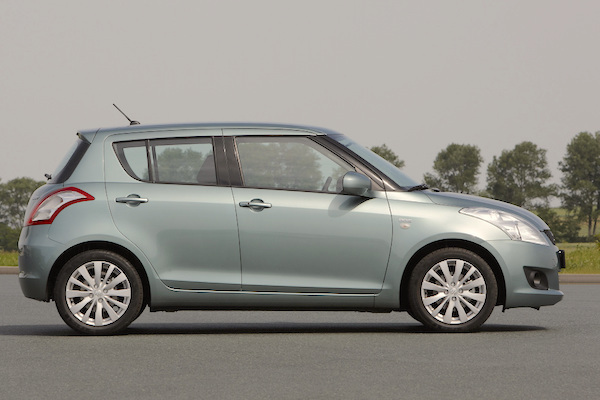 The Maruti Swift smashes its Indian volume record in April. The Indian new car market is going from strength to strength this year with April wholesale volumes up another 15% year-on-year to 277.148, lifting the year-to-date tally to 1.076.818, up 12% on the same period in 2016. Market leader Maruti Suzuki once again manages to cross the 50% market share milestone at 52% thanks to sales up a stunning 23% year-on-year to 144.081, a new all-time monthly record for the brand, beating the 137.277 hit last September. Maruti’s market share record remains 52.2% from last November. Hyundai trails the market growth at +6% in 2nd place with Mahindra freefalling 16% at #3. Honda (+38%), Toyota (+52%) and Tata (+22%) all post brilliant gains but Renault loses steam at -23% now that the Kwid (-19%) is old news. Volkswagen (+21%), Datsun (+71%) and Skoda (+50%) also shine but Fiat (-40%) tumbles down. Big surprise atop the Indian models ranking this month: taking the overall lead, the Maruti Swift is up 52% on April 2016 to smash its volume record to 23.802 from 19.669 in January 2015. Note the new generation Swift hasn’t arrived yet in India whereas bookings for the facelifted Swift DZire sedan variant are now open. The Maruti Alto follows with an equally impressive 36% gain while the Maruti Baleno is up 83% to a second consecutive volume record at 17.530. The Maruti Wagon R delivers its 2nd highest ever volume at 16.348 (+7%) just below its record of 16.645 from last September and the Hyundai Elite i20 does exactly the same at 12.668 below the 12.812 units hit in March 2015. Finally, in a month of records the Maruti Vitara Brezza (+36%) improves its personal best to 10.653 sales, remaining the country’s best-selling SUV just above the Hyundai Creta (9.213). Among recent launches, the Maruti Ignis slides down 3% on last month but remains inside the Top 20, the Tata Tigor improves 21% on it inaugural month and the Honda WR-V is down 15% but strong at #26, Honda’s second best-seller below the City. One year ago: India April 2016: Leader Alto down 23%, hit by Kwid? Full April 2017 Top 22 All-brands and Top 90 models below. India July 2014: Is the Datsun Go a flop?